In 1915-17, the City-County Building was constructed in the block bounded by Grant St, Forbes Av, Ross St and Fourth Av. 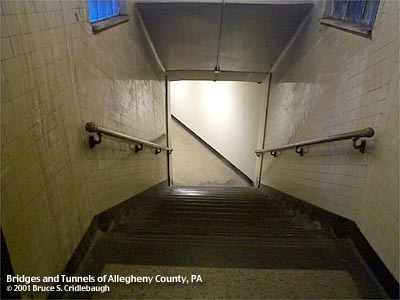 In the year following its completion, a tunnel was dug under Forbes Av to link the basements of this building with the adjacent Allegheny County Courthouse. 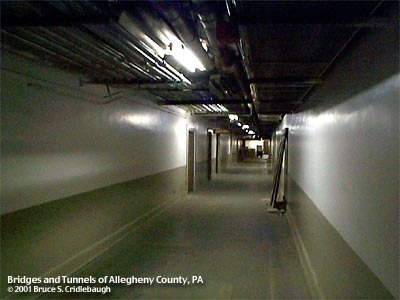 As other related buildings were constructed in adjacent blocks, a network of tunnels was created -- with the City-County Building as the hub. The Grant Building rose opposite Fourth Av in 1927-30. The County Office Building by Stanley L. Roush was built across Ross St in 1929-31. The Grant Building was primarily occupied by lawyers. 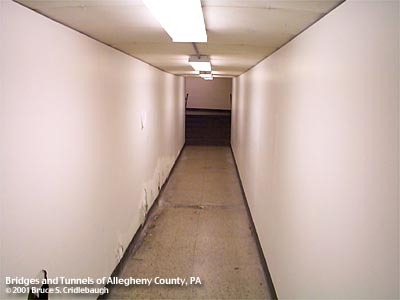 A marble-walled entry from the lobby leads to a tunnel connecting to the basement of the City-County Building -- from there a series of tunnels leads to the Courthouse and County Office Building. 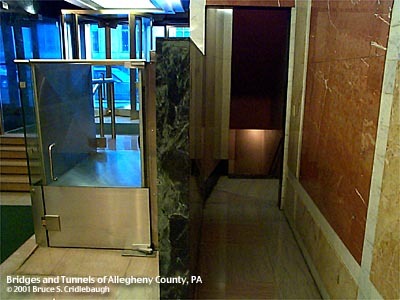 Although a bronze plaque near the Grant St entrance of the City-County Building lobby heralds the tunnel, the connection to the Grant Building from the City-County Building is less obvious once in the basement. Four hallways form a rectangle to complete the connecting hub under the City-County Building.